BBC Scotland had an interesting piece on tonight's television news. Mick Berwick, Patrick Winterton and Olly Hicks have set off from Shetland on an epic unsupported crossing of the North Sea to Norway by sea kayak. The crossing is to highlight the importance of the Shetland Bus: small fishing boats that linked these two communities in the dark days of WW2. They are also raising money for Make a Wish and the RNLI. You can support their fund raising by making a donation here. 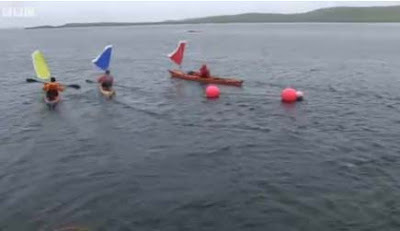 I was delighted to see they were using Flat Earth kayak sails. They had been having some problems with the rigging of the sails and I gave Patrick some tips before they departed. I hope that the other's will be able to tighten up Mick's (yellow sail) starboard stay. His sail is sagging to leeward a bit! I hope their energy levels and spirits don't sag on their 4day/3night crossing! Sadly, it looks like they have had to turn back.